New bill on the top, old bill on the bottom. Ahhh, the smell of money. Although many people like to carry around plastic in their wallets instead of paper bills, there is still a need to thwart counterfeiters who always try to outsmart the latest security improvements included in U.S. currency. Today, high ranking members from the Board of Governors of the Federal Reserve System, the U.S. Department of the Treasury, and the United States Secret Service pulled the wraps off the newest design for the $100 bill, the highest currently available denomination available for U.S. currency. According to U.S. Department of the Treasury – the most circulated and counterfeited of all U.S. bills — the total worldwide circulation of the $100 bill is $890 billion according to the Wall Street Journal. In addition, roughly two-thirds of all $100 bills in circulation can be found overseas. The new $100 bill features new security enhancements to cut down on counterfeiting including a 3D Security Ribbon that has images of 100s and bells which change position as you move the bill and a “Bell in the Inkwell” image that changes colors from green to copper depending on how the bill is oriented. 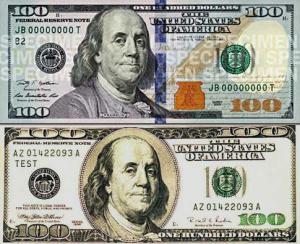 The new $100 bill will be ushered into service on February 10, 2011.